A product of Netflix’s monumental content-producing machine and Winner of the Audience Award for US Documentary at the 2017 Sundance Film Festival, Chasing Coral is unlike most of the content you’re used to playing on the US streaming service; there’s no sparkling Hollwood stars, no household-name directors and no CGI (which is kind’a unbelievable given the spectacular visuals). With 500 hours of underwater footage shot over three years director Jeff Orlowski has crafted a drama that documents the crucial role that corals play for the health of marine ecosystems and, indirectly, for that of our planet, thanks to a symbiotic relationship with the surrounding environment. At the same time it also shows the disastrous effects that climate change is having on these complex organisms. From its first moments Chasing Coral is visually staggering, marking the quantum leaps that have been made in underwater photography since Jacques Cousteau first took his camera into the murky depths, and it uses these optical spectacles to reel in its audience to confront it with the trouble that’s happening down below. Corals might look like giant undersea carpets or rock formations, but they are living organisms and seen up close they have an incredible variety and beauty. And in the last three decades they’ve been dying off at a stunning rate. 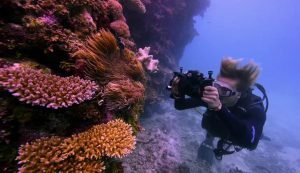 Chasing Coral documents for the first time a global bleaching of corals – the third, which took place in 2015 – which is one of the first proofs of warming oceans and acidification. Corals turn white because they’re sick, their reaction to this “fever” being to turn white, almost fluorescent. When they’re white, they’re still alive and waiting for someone to save them. We’re not going to be saving any corals at Elm Green School on 14 May but we are hoping to raise awareness for marine ecosystems and a wider range of environmental issues. Come down for the screening at 7:30pm and meet people from the school as well as from Lambeth for a Cool Planet and see what people are doing in your local area to protect our environment and find out some ways in which you can get involved.